It’s that time of year again. Everybody is talking about the ads for the Super Bowl. Well, at least, everybody in the marketing world. I admit I am not such a huge fan of advertisements, and I have not been watching all the spots for a long time. The first year I got into the Super Bowl ads fever was when Budweiser came up with their “Puppy Love” in 2014. Yes, you got me: I am a dog lover – plus I adore horses. The combination of both made me share that spot in my social media channels and show it to friends, something I rarely do. I loved this ad so much; I also watched the previous spots of Budweiser featuring these impressive Clydesdales horses. And the next year, naturally I was looking forward to seeing what Budweiser had come up with for Super Bowl 2015. And they did not disappoint me, “Lost Dog” it was. I was not alone with my excitement for these ads. 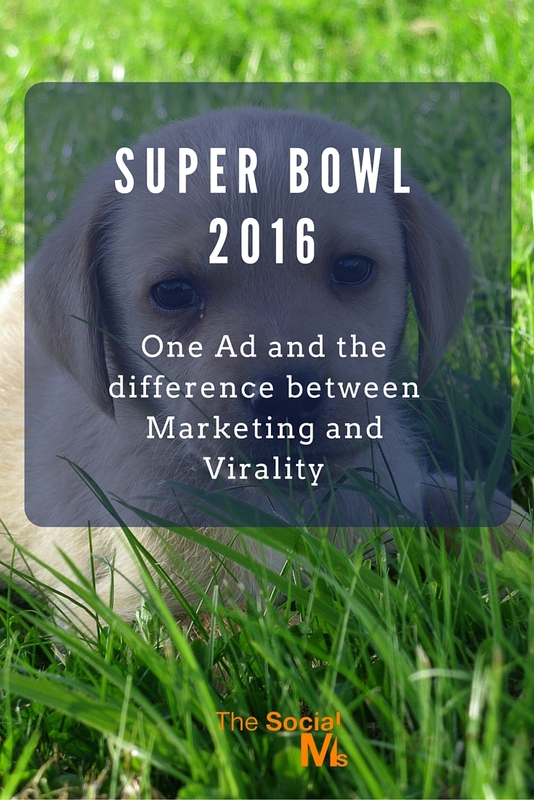 Both these spots are the two most popular Super Bowl ads of all time. This week some of the ads for Super Bowl 2016 were released, and I was a little surprised to find that Budweiser had chosen an entirely new alley: Helen Mirren talking about “Don’t drink and drive”. Why does a company that had the most popular Super Bowl Ads of the past years totally change the advertising strategy? The simple truth is: The spots were popular but not as successful as they could have been. How is that? Well, that people like, watch and share the ad does not mean they drink more Budweiser. Jorn Socquet (U.S. VP-marketing for A-B INBev) in November 2015. It is not the first time, and it is certainly not the last time when the popularity of something does not necessarily result in success. Something can totally go viral and not fulfill the marketing purpose at all. When talking to young entrepreneurs who think about starting with social media marketing, we hear a lot of talk about „viral“: Our business is going viral, Why don’t we brainstorm something that is going viral. There is a lot of mistaking virality for a sustainable marketing strategy. Apart from the fact that there is very few going viral just by being there, the whole notion of something going viral to be the solution to your marketing problems is utterly short-sighted. Plus: Most of the time the virality is more or less bought. How much money do you think did Budweiser invest into the Super Bowl Spots? 30 seconds of advertising time during the Super Bowl in 2013 cost more than 3.8Mio $ and that does not include the production of the ad in the first place. Nothing is going viral without an initial audience, which makes virality for young and new entrepreneurs more of a pink fairytale than an achievable goal. And that makes companies like Budweiser invest such an insane amount of money to get their ad in front of the Super Bowl community – and not only them, because today the hype about Super Bowl advertisements starts long before the actual game and scores big in the media right before and after the event. Still, even if you invest a ton of money, get everything right and manage to have something going viral: Here is the problem: That does not guarantee you any positive impact on your business. A while ago Jonathan noticed that some of his actions on Quora had inspired something close to virality. He had started that conversation back when we were still running the publishing platform exploreB2B. And the truth is, we never noticed any impact on the platform from it at all and totally forgot about it. Months (or years) later, Jonathan logged into Quora and “Holy Cow?” What was going on? Here is what happened “Something I Did Went Totally Viral – and All I Got Was a Lousy Article Idea“. The truth is: You need a sustainable marketing strategy, and only if you have that, something going viral may help you push your marketing to the next level. If that happens, be happy about it and keep going. Because virality is rarely something to last. which is from Neil Patel’s 100.000 $ Challenge: They had one post going viral in September, resulting in a spike of traffic for a few days and traffic turning back to normal afterward. If you can turn that spike can into money (= sales) that is good – if not, and that is what apparently Budweiser experienced with their Puppy love commercial, then all popularity or virality of something is not worth sh$t. Enjoy it while it lasts, and get back to working on your marketing strategy.